It appears to be good and bad news for the Nanticoke River. 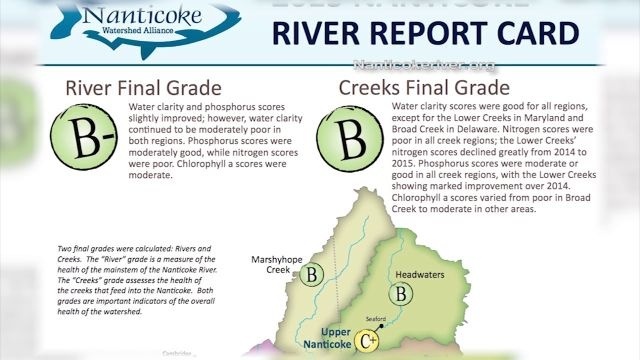 According to their latest report card released Thursday, the river received a grade of B-minus. Beth Wasden, volunteer and outreach coordinator for the Nanticoke Watershed Alliance, says all four of the northern sub-watersheds received grades of F’s in total nitrogen. Levels were considered too high. We’re told levels actually improved slightly in 2014, which was initially hopeful. Wasden notes certain sub-regions received A-minuses in phosphorus levels. An excess of these nutrients can cause overgrowth of algae, potentially depleting oxygen in the water. “On one hand, we have really positive nutrient scores and on the other hand, we have really awful nutrient scores so we need to find some ways to reduce the nitrogen and continue to work on phosphorus,” she says.